Owner and Coach of CFC. 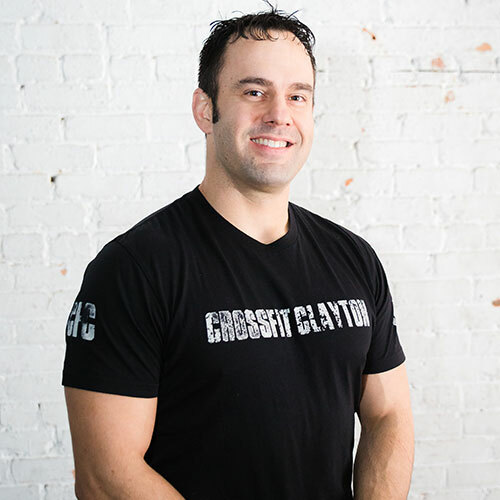 Former CrossFit regional competitor and strongman athlete. Growing up I was active in many competitive sports; baseball, football and wrestling. In my free time I played hockey, tennis, basketball, lacrosse and worked out regularly. I wrestled in the National Collegiate Wrestling Association at Miami of Ohio and became an All-American my freshman year (2nd at 165 lbs, 2000), but gave up my love for wrestling to focus on getting my Bachelor of Science from The Ohio State University (Go Buckeyes!!). My passion has always been training, and I began CrossFitting in 2008 and fell in love with the sport. I competed in the CrossFit Open in 2011 and 2012 and qualified for the Mid-Atlantic Regionals where I finished 13th and 5th, respectively. I currently train for the enjoyment. I’m married to my beautiful wife, Lura, who is also an avid CrossFitter. We have two beautiful daughters, Kelsy, born July 4th (a firecracker for sure! ), and Brynlee, born December 31st (New Year’s Eve baby!). Training is a way of life. The physical benefits of training alone are enough to continue to stay active and work hard. However, beyond just the physical components of training, I feel that there is a lot to gain mentally. Training forges an iron will. You learn the value of hard work, discipline and accountability, and along the way the challenges you face in the gym make you more courageous, confident and ready to tackle any of life’s other challenges. Train hard and live life to the fullest.